That said, the real sales price history is even more interesting, if less startling, especially when you add a bit of detail from the broker babble to the mix. I am going to leave you in that teased state for a minute, and talk about the charms of this loft. If you count the entry level as two levels because the living room is sunken (you should; it sinks quite a bit), this penthouse loft has four levels: those two, plus a mezzanine level with the bedroom, walk-in closet and bath, plus the roof level with a (small … er … “cozy”) office at the top of the stairs and the “625 sq ft” private roof deck. At only “1,600 sq ft” interior, that is an awful lot of up-ing and down-ing. I had to toggle back and forth between the floor plan and the listing photos many times before I could make sense of the space, a task not helped by the fact that the bedroom photo (listing pic #2) shows a window that does not appear on the floor plan, and that the other “exposure” of the bedroom (“2 exposures and open city views”) must be due to the bedroom being open to the living room (with those “huge windows framing ESB [Empire State Building, of course] and Abington Sq Park views”, even though those windows seem to end below the floor of the bedroom), as you will see a low glass barrier opposite the bathroom wall in that bedroom. But wait … there’s more funk in the layout! To get a sense of how limited that “soaring ceiling” in the living room really is, note how closely the 4th listing photo is cropped. The wall of windows seems to be about three feet from the end of the “L” shaped couch, the long side of which backs against the short wall the kitchen is on, just above. Listing photo #3 shows the floor level at the entry (and into the dining area) being about even with the bottom of those “huge” windows; those windows, in turn, sit about 3 feet above the floor of the sunken living room (pic #4). Notice the extreme angle from which that dining room photo was taken: no higher than the backs of the dining chairs. Of course, taking photos from a low angle is a classic photographer’s trick for making a room seem taller than it is. Another word about the layout. Understanding that all floor plans come with disclaimers, express and implied (“not to scale”, “for purposes of illustrations only” are two that should always be understood whether express or implied), and that measurements are often … er … fanciful (not a word you will see in babbling), look at the three pieces of the floor plan with the knowledge that the roof deck is babbled as “625 sq ft”. An architect would draw these with the skylights lining up in the same place on each level (as the stairs do), and with the south wall being the same length on each. But my point is that if the marketing materials think that roof deck is only 625 sq ft, the other levels must be the sum of that plus whatever space is taken up by the stairway plus that upper landing with the “cozy” office. Maybe that’s 12 x 4 feet of interior space on both the mezzanine and roof levels devoted to the up-ing-and-downing. Maybe what you’ve got is two boxes of no more than 750 sq ft on top of each other, with the lower box having an end with a lower floor and the upper box leading to the roof. With windows only on the east wall and low-ish (for lofts) ceiling heights on most of the entry level and all of the mezzanine (note especially pic #2), there’s not much sense of ‘volume’ in this interior. But that’s not what sold this loft. There’s no ceiling on the roof deck, the subject of no fewer than four listing photos. It is very difficult to get a sense of the value of well-appointed interior space in this small (16-unit) coop because the last six sales have all involved outdoor space, going back to February 2010. (So I won’t try to get a credible baseline interior value per foot from which to begin to systematically assess how valuable the roof deck is in loft #6B; sorry, Fans of The Miller.) We can play with the last two sales a bit, however. 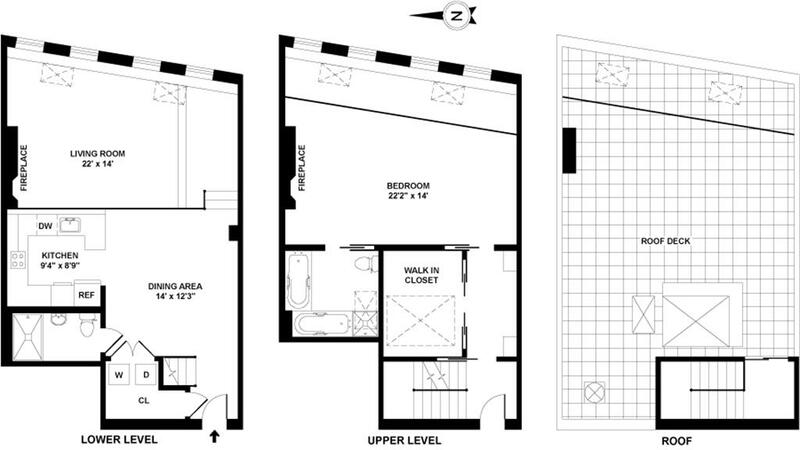 The “1,300 sq ft” loft #1A sold on February 25 for $1.59mm with a patio of about 200 sq ft (floor plan, here). That patio (no matter the size) is a very different animal than the #6B roof deck, open to the sky. And there’s no bragging about finishes, so this loft is likely not the equal of #6B’s interior finishes. Plus there’s no premium for a view way down at sidewalk level, and below. But #1A sold for only 54% of the market clearing price of #6B. The August 2012 sale of duplex penthouse loft #6D was marred, for comping purposes, because that marketing campaign was coy silent about size. That one had two terraces (over 400 sq ft in total, with appropriate disclaimers) and little bragging about finishes apart from a “stylish renovation of the kitchen”. Certainly there is less space in #6D than in #6B (though each has but a single bedroom), but note the price 20 months ago: $1.515mm. In other words, nothing has sold in the building in the league of #6B at $2.95mm. I’m just going to say that the roof deck added tremendous value to #6B. Now let’s get back to #6B’s fascinating history. That is, of course, very different than if the 2005 buyer at $1.699mm sold for $2.995mm in April 2008 (just about at quarter-formerly-known-as The Peak) and then that 2008 buyer sold in 2010 at $1.9mm. Indeed, this clean sequence looks logical, with a big jump in the 11 years before 2005, a small jump to 2010, and another big jump to the present. But what if there were an intervening renovation? That could change the logic…. finally for sale after $750,000 of renovations by some of the top architects and interior designers in the city. … new dark chocolate hard-wood floors through-out. Two full baths in slate, Ann Sachs fixtures and sky lights – top, top renovations. The open kitchen features highest-end stainless steel appliances like Gaggenau, Miele and Sub-Zero. Miele W/D. Speakers in the walls in every room, including bathrooms. Exposed brick and hard-wood floors through-out. Two full tiled baths. The open kitchen features a dishwasher and microwave. Your future home also includes a washer and dryer. … Walls of closets, built-ins and shoe closets. The master bathroom is built with a curved brick glass wall, and features an oversized Jacuzzi and dramatic skylights. I have to believe that if there had been “$750,000 of renovations by some of the top architects and interior designers in the city” when the loft was sold in 2005, there’d have been some serious bragging about it. Instead, we get this “open kitchen features a dishwasher and microwave”. Now look back at the closed sale sequence above, knowing that between 2005 and 2010 there was “$750,000 of renovations by some of the top architects and interior designers in the city”. Pretty exciting, huh? And depressing for the 2010 seller, whose $201,000 “gain” was offset by (again!) “$750,000 of renovations by some of the top architects and interior designers in the city”. Let’s review the common knowledge about The Market in that time period: Manhattan residential listings that closed in the calendar quarter that began shortly before this 2005-buyer-(eventually)-turned-2010-seller came to market saw the highest prices recorded to date; that owner picked the wrong time to go off the market (July 2008 was two months before Lehman’s bankruptcy roiled The Market); hence, the $305,000 price drop when the loft came back to market in November; it is not terribly surprising that the loft did not sell in that round, despite two price drops, as that was a very thin market, populated with relatively few buyers, all of whom can be characterized as courageous; it is a little surprising that the loft did not sell higher than it did in 2010, though not surprising that it took only 17 days to get into contract. Either the seller simply lacked patience at that point (understandable, that) or The Market was punishing the loft (for no good reason). That 2010 buyer clearly stepped in when others would not. And got a bargain. The overall Manhattan market (as measured by the StreetEasy Condo Index of same-sales) was up 23% from July 2010 until March 2014 (it had been 1,890 and went to 2,317). This loft? Up 54%. That’s exciting.